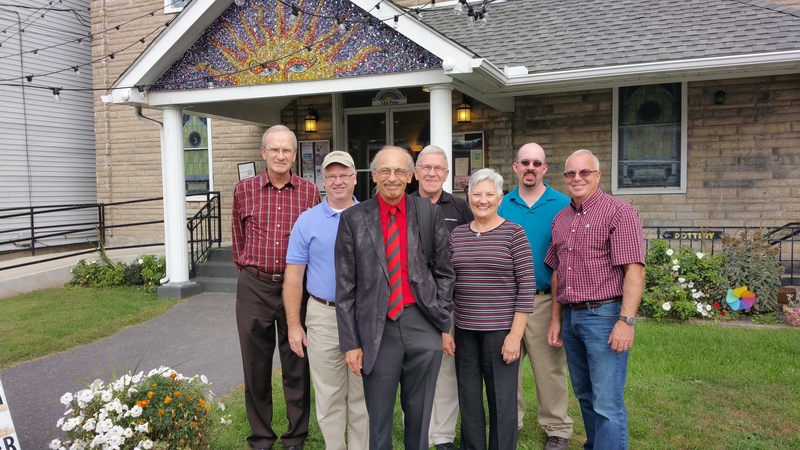 Pictured are mission group members Bill Barker, Mark Abernathy, Dewey and Kathie Aiken, Steven Gintz, Barry Whitworth, and Tamaqua Community Arts Center volunteer Jack Kulp. – Barry Whitworth is part of the North American Missions Board. He oversees missions work in Northeast PA.
– Mark Abernathy is the consultant for missions and men’s ministry in North Carolina. He directs and organizes missions teams, including the team that came from North Carolina to help with the kids club at the bungalow and block party during the “Tamaqua in a New Light” event. – Dewey and Kathie Aiken are part of the Appalachian Regional Ministry and are National Mission Service Corp Missionaries. They are supplying us with free bookbags with food, toys, and other essential items for the kids who come to the Community Christmas Celebration at the Arts Center on Dec. 5, 2015 from as part of the Spirit of Christmas Festival.